Could the First 'Jay & Silent Bob Reboot' Image Hint At a Major Character's Return? There was, for Askewniphiles who want to look for such things, quite a bit packed into that first behind-the-scenes image from Jay & Silent Bob Reboot...but one thing that has gone largely unremarked-upon could reveal the return of a major character from Mallrats. ...No, not Brodie Bruce. He is right there, Dixie cup in hand, hanging out at Brodie's Secret Stash with the pair, so that is hardly a secret at this point. Additionally, we are not talking about the Stan Lee cameo which apepars to be there in the form of posters of the late comic book legend hanging around the store. Instead, here's the question: Could Shannen Doherty's Rene be returning in Reboot? Rene was Brodie's love interest in Mallrats. At the start of the movie, she was his longtime girlfriend, who dumped him for having no ambition and being a generally crappy boyfriend. By the end of the film, the combination of his assertive action on behalf of himself and his friend T.S. and traditional romantic-comedy tropes made her fall back in love with him again. After the film's credits rolled, in old-school Universal comedy style, most of the characters got their title-card happy endings...or, at least, endings, since Ben Affleck's Shannon Hamilton went to jail and was sexually assaulted. While Affleck is unlikely to return for Reboot -- it seems he and Smith have not talked in years -- Rene is a distinct possibility. Well, Brodie is wearing a wedding ring in the photo. 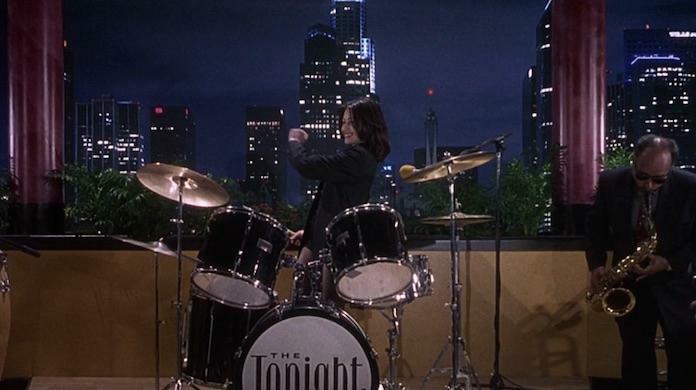 In the title card at the end of Mallrats, Brodie was revealed to have won over the network executives with his acerbic performance on Truth or Date and embarked on a career that culminated with a gig hosting The Tonight Show. Rene, it seemed, was his bandleader. While many of the characters from Clerks, Mallrats, and Chasing Amy recurred through other films (and those actors became Smith's regular acting troupe for a while), Rene was not one of them. She has not reappeared since Mallrats, although Shannen Doherty did have a cameo -- playing herself -- in Jay & Silent Bob Strike Back. Could Brodie's wedding ring suggest that his wife might appear in the film? 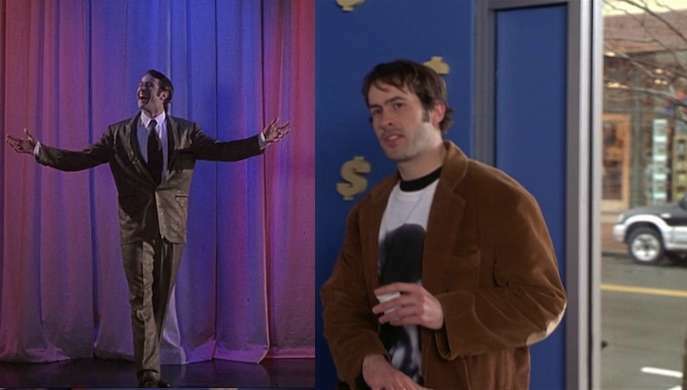 The reason we ask is simple -- in previous post-Mallrats appearances, Brodie has not worn a wedding ring, despite apparently being married to Rene. That goes for both his closing title card in Mallrats as well as his cameo in Jay and Silent Bob Strike Back. Or, this is a signifier that Rene could be a more significant presence this time around, theoretically with Doherty reprising the role. No one of the three is necessarily more likely than the others, but certainly it seems unlikely that Smith would have Brodie remarry since Mallrats was, at its heart, a romantic comedy that centered on him pursuing and reuniting with Rene. Since it seems clear that his comic shop has shifted (to the mall, a callback to that first appearance), it could be that we will see more of his life, potentially including ideas Smith may have had for Mallrats 2 back when that was still a thing that was going to happen. In any event, it's always fun to speculate about such things, and after a single image, we have this one thing to speculate about. Jay & Silent Bob Reboot is in production now. There is no firm release date yet, although Smith has identified the fall as a release window. Jay & Silent Bob Strike Back, the movie of which this is a "reboot," was released in theaters on August 24, 2001.